Happy Monday!! Did you watch the Royal Wedding? I did. I woke up around 3 am on Saturday to start watching the whole thing but by 5.30 am I was all tired and ready to sleep. It was worth it though, I loved it! Meghan looked gorgeous and Harry sweet as always! Hope they live happily ever after! (BTW if you haven’t looked at my Royal Wedding themed cake, you should take a look, it tasted really really good). I was craving something with chocolate but I just didn’t want to go to the grocery store and buy a chocolate bar, I got cherries and guess what! 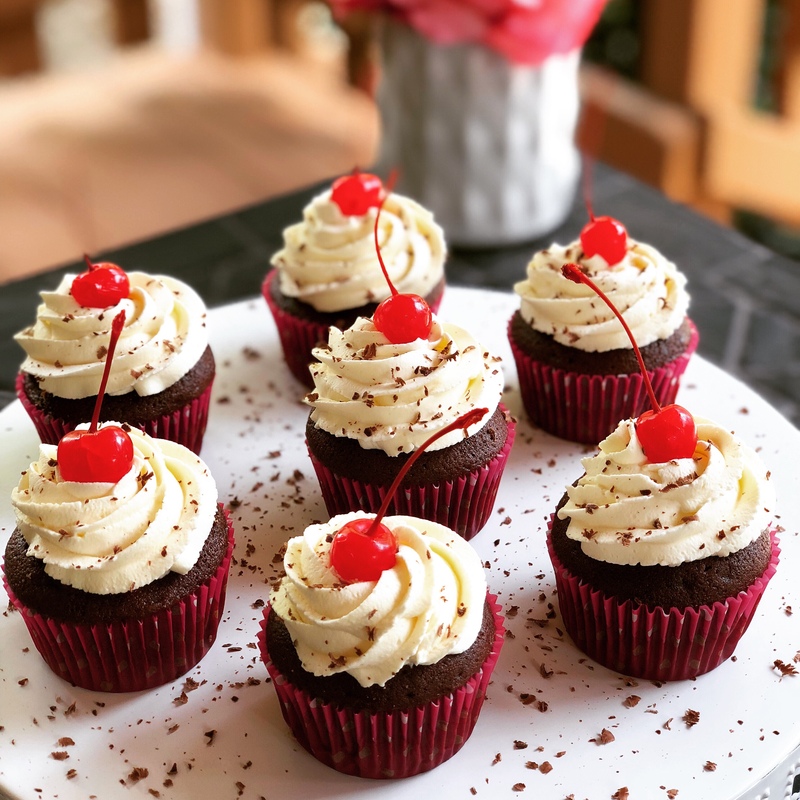 Black Forest Cupcakes it was! Chocolate cake + Cherry Compote + Vanilla Whipped Cream = HEAVEN! Let’s start with the recipe …. Drain the thawed cherries (you can thaw them in the microwave), reserving the juice in a liquid measuring cup. Add enough water so that the total liquid equals 1¼ cups. Add the liquid to a medium saucepan with the sugar and cornstarch. Heat over medium-high heat, whisking occasionally, until the mixture begins to bubble and thicken. Continue whisking so no lumps form. Once thickened, remove from the heat and whisk in the lemon juice. Fold in the drained cherries with a spatula. Stir in the kirsch. Cover and chill until ready to use. 1.- Preheat the oven to 350˚ F. Line standard cupcake pans with paper liners. In a small bowl, whisk together the cocoa powder and hot water until smooth. In a medium bowl, whisk together the flour, baking soda, baking powder, and salt; set aside. 2.- In a medium saucepan, combine the butter and the sugar over medium heat. Heat, stirring occasionally to combine, until the butter is melted. Remove the mixture from the heat and transfer to the bowl of an electric mixer fitted with a paddle attachment. Beat on medium-low speed, 4-5 minutes, until the mixture is cooled. Mix in the eggs, one at a time, scraping down the sides of the bowl as needed and beating well after each addition. Mix in the vanilla and then the cocoa mixture and beat until incorporated. With the mixer on low speed add in the dry ingredients in two batches, alternating with the sour cream, beating just until combined. 3.- Divide the batter between the prepared cupcake liners, filling them about ¾ of the way full. Bake 20 minutes or until a toothpick inserted in the center comes out clean. Allow the cupcakes to cool in the pan for 10 minutes, then transfer to a wire rack to cool completely. Hold a baked and cooled cupcake in one hand and insert a small paring knife, at an angle, about half way down into the cupcake. Cut out a cone shaped piece out of the center of each cupcake. Fill each with a spoonful of the cherry filling. 1.- To make the whipped cream frosting, add the heavy cream to the bowl of a stand mixer fitted with the whisk attachment. Start beating on medium-low speed, slowly increasing as the cream begins to thicken up to medium-high speed. While the cream is being whipped, gradually add in the confectioners’ sugar a spoonful at a time. Whip the cream until stiff peaks form. (Be careful not to overbeat!) Fold in the vanilla extract. 2.- Frost the filled cupcakes with the whipped cream. (I used a pastry bag fitted with an WILTOM 1 M) Garnish with cherries and chocolate shavings. 3.- Refrigerate until ready to serve. 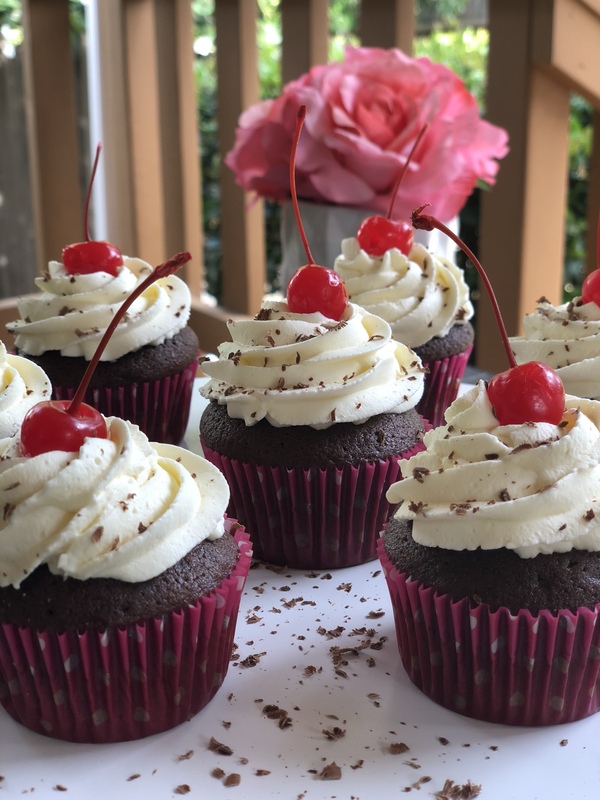 This entry was posted in Recipes and tagged black forest cupcakes, cake, cherries, chocolate, cupcakes, dessert, recipe.